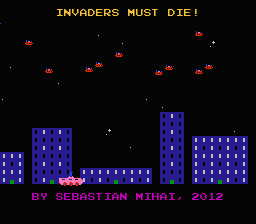 Sebastian Mihai - Nintendo NES development - Invaders must die! It took me a while to find a good devkit for the NES. The one I put together is based on the cc65 compiler (NES uses a 6502-based CPU). The compiler suite is a bit unwieldy, so I found a library called rNES, and I added it to the tool chain. The graphics were drawn using the same Excel tile editor I used for Burly Bear vs. the Mean Foxes (for the Gameboy), although modified slightly. Developing for the NES was similar to the Gameboy. Decently easy to use hardware sprites, along with the annoying low sprites-per-line limits, which cause flickering. Otherwise no problems. Invaders must die! was developed in about a day's time. 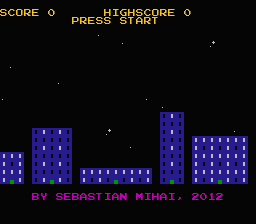 You are in charge of controlling a tank, shooting UFOs that drop down on your beloved city. If even one UFO reaches the street, it's all over! Aliens will spill into the streets, destroying humankind, and taking over the planet, with the purpose of using it as a huge farm for their colonies. No, you will not see all this happen if you lose the game. The invaders speed up as you kill them. When they're really fast, be careful not to miss. It's important to not miss because you can only shoot a missile at a time. The title was inspired by Prodigy's album with the same name. Note: This package also includes my Lynx projects. If you have already downloaded it from any Atari Lynx project page, you do not need to download it again; the NES projects should already be included. emulator - nesterJ NES emulator. I have used it for my debugging.